Bulguksa, one of Korea's largest and most often visited temples, sits on the side of T'oham-san (T'oham mountain) directly east of Gyeongju, in Gyeongsang province. If legends written during the Joseon Dynasty are correct, the temple is one of the oldest, if not the oldest, surviving temples in Korea. The temple area is the home of six Korean National Treasures, including Dabotap and Seokgatap stone pagodas, Cheongun-gyo (Blue Cloud Bridge), and two gilt-bronze statutes of Buddha. The temple is classified as Historic and Scenic Site No. 1 by the South Korean government, an honor fitting to the stature of the religious and cultural site. In 1995, Bulguksa was added to the UNESCO World Heritage List together with the Seokguram Grotto, which lies four kilometers to the east. Bulguksa is recognized as a masterpiece of the golden age of Buddhist architecture and art in the Unified Silla dynasty. Currently (2007) the temple serves as the head temple, 11th district, for the Jogye Order of Korean Buddhism. King Beopheung of Silla originally constructed a smaller temple, called Hwaom-popnyu-sa, on this site in 528 C.E.. Beopheung had the temple constructed for his queen as a place to pray for Silla's peace and prosperity. That small temple highlighted the influence of Buddhism in Silla and foretold the profound influence that Buddhism would have in the Unified Silla Dynasty. Two hundred years later during the reign of King Kyongdok, Prime Minister Gim Daeseong expanded the small temple to its current size and grandeur in 774 C.E., renaming the site Bulguksa, translated variously "Buddhist Country Temple" or Temple of the Buddha Land. The Silla royal court completed the building in 774 C.E., after Gim's death, and given its current name Bulguksa. Fascinating legends surround the life of Prime Minister Gim. During his first life, he lived an extremely poor life with his widowed mother. He had a big head and flat forehead; hence he received the nickname "Big Wall" (Daeseong). Legend notes poor Daeseong as an honest and faithful disciple of Buddhism. After his death, Daeseong experienced rebirth into the family of Prime Minister, Kim Mun-yang. They received a prophesy of Daeseong's by a mysterious voice from heaven. The characters for Daesong were written in gold on his palm at birth. As Daesong grew into manhood, he received the inspiration to build the marveleous memorial in honor of his first and second parents. He designed and constructed Bulguksa in honor of the parents of his second birth, the Prime Minister and his wife. He built Sokuram shrine nearby to honor his first mother. Although the legends strike may strike us as fantastic, any one visting the memorials will experience a sense of awe beholding the magnificence of the artistry. The temple was renovated during the Goryeo Dynasty and the early Joseon Dynasty. During the Japanese invasions between 1592 and 1598, the wooden buildings were burned to the ground. After 1604, reconstruction and expansion of Bulguksa started, followed by about 40 renovations until 1805. During the Japanese occupation of 1910-1945, the Japanese conducted a restoration, but there are no records of the work done, and known treasures disappeared during this time. After World War II and the Korean War, a partial restoration was conducted in 1966. 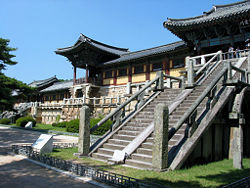 Upon an extensive archeological investigation, major restoration was conducted between 1969 and 1973 by the order of President Park Chung Hee, bringing Bulguksa to its current form. The famous stone structures are preserved from the original Silla construction. At the peak of Bulguksa's glory, 80 wooden buildings graced the site, ten times more than today. Even with the diminished size of Bulgaksa, the visitor will find themselves awe struck by the beauty and grandeur of the temple architecture. For that reason, the South Korean government designated Bulgaksa Historic and Scenic Site #1. National Treasure #23 Stair Entrance is in the foreground while National Treasure #22 Stair Entrance is in the background. Sokkye-mun, two stone staircases and gates, (National treasures of South Korea|National Treasure No. 22 and No. 23) serve as the traditional entrances to the temple grounds. These two double level bridges rise and enter the 100 meter stone wall. The bridges have been restored using the original stone blocks. As the pilgrim mounted the "Blue Cloud Bridge" he symbolically left the world of suffering and entered "The Buddha Country," or "Bulguk." The larger bridge stairway Baegungyo (White Cloud Bridge, 백운교) (National treasures of South Korea|National Treasure No. 23) is 33 steps high, corresponding to the 33 steps to enlightenment terminating at the gate of Jahamun (Mauve Mist Gate 자하문), which leads to Sakyamuni Hall. Baegungyo (White Cloud Bridge) is 5.4 meters and has 16 steps. One long single piece of granite is set down the center of each staired section. The lower portion, Cheongungyo (Blue Cloud Bridge, 청운교) is 6.3 meters long and has 17 steps with an arch eight feet wide and 12 feet high. There are 13 stones spanning the larger arch. Under Cheongungyo stairway a small fish pond representing the pure land of Buddha or Western Paradise of the Amit'a world once sat. The second bridge stairway (National treasures of South Korea|National Treasure No. 22), sits to the left of the larger stairway. Seventeen steps lead the pilgrim through Anyangmun (Peace Enhancing Gate, 안양문), the gate at the top of the stairs, and into the temple Geuknakjeon (the Hall of the Pure Land) dedicated to the Amit'a Buddha (National treasures of South Korea|National Treasure No. 27). Like its bigger conterpart, this bridge stairway has a higher and lower section. The lower flight of steps, Yeonhwangyo (Lotus Flower Bridge 연화교), and the upper flight of steps, Chilbogyo (Seven Treasures Bridge 칠보교) has a width of approximately three meters. The Lotus Flower Bridge is known for its delicate carvings of Lotus Flowers on each step but these have faded with the weight of many pilgrims. Today, visitors are restricted from walking on the bridge. Haengnang, Chongru, and Kyongru. 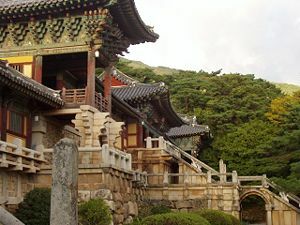 Surrounding the Geuknakjeon and Daeungjeon temple compounds is Haengnang (Walking Corridor), or a roofed corridor open the the courtyards while closed to the outside. The restoration of the Walking Corridor was completed in 1973. One–hundred–and–thirty pillars support the Haengnang around the larger Geuknakjeon temple while 73 pillars support the Walking Corridor around the smaller Daeungjeon temple. Chongru (Bell Pavilion) is located between the two bridge stair entrances. A large drum is set on the back of a turtle. Chongu sits on two stout wooden pillars, projecting over the retaining wall. A walk way is under the pavilion. Kyongru is a corner pavilion that sits to the right of the larger stairway entrance. Destroyed by fire earlier, the pavilion has been rebuilt. A colorful, large wooden carp and elaborately designed gong are housed there. Dabotap and Seokgatap stone pagodas. 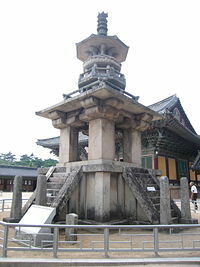 There are two pagodas on the temple main Daeungjeon site. 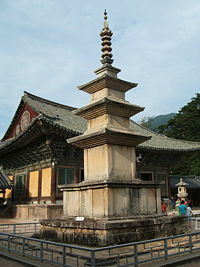 The three-story Seokgatap (Sakyamuni Pagoda) which stands at 8.2 meters is a traditional Korean-style stone pagoda with simple lines and minimal detailing. Seokgatap is over 13 centuries old. Dabotap (Many Treasure Pagoda) is 10.4 meters tall and dedicated to the Many Treasures Buddha mentioned in the Lotus Sutra. In contrast to Seokgatap, Dabotap is known for its highly ornate structure. Its image is reproduced on the South Korean 10 South Korean won coin. Dabotap and Seokgatap are South Korean National Treasures nos. 20 and 21, respectively. Legend tells the story of Asa-dal, the master craftsman who designed and created the architectural plan for the two pagodas. He may have come from Paekche or even as far as T'ang China. The story of Asa-dal and his wife, Asa-nyo, is one of the saddest stories of Silla. While Asa-dal dedicated himself to creating Seokgatap and Dabotap, his wife attempted to see the shadow of her husband reflected in Shadow Pond. She saw could only see the shadow of pagoda Dabotap and not the shadow of Seokgatap where her husband worked. Dabotap received the folk name Yong-t'ap (Shadow Pagoda) and Seokgatap the folk name Muyong-t'ap (No Shadow Pagoda). Asa-nyo died while her husband worked on the pagodas. Could it have been from lonliness? At the place of Asa-nyo's death, Asa-dal sculpted a stone seated Buddha in honor of his wife, then returned to his own country alone. Koreans and visitors alike are struck by the calm simplicity Asa-dal created in Seokgatap named after the Buddha absorbed in transcendent peace. The Dabotap's complexity symbolizes Dabo Yorae's (Buddha of Many Treasures) manifestation in a complex universe. Asa-dal constructed Dabotap without motar to hold the stones together. Shakyamuni Buddha Main Hall (Daeungjeon). The pilgrim departs this world of suffering by ascending the Cheongungyo (Blue Cloud Bridge)and Baegungyo (White Cloud Bridge), entering Buddha Country through Jahamun (Mauve Mist Gate). Passing through Jahamun the disciple has entered Nirvana. He continues to the Daeungjeon main hall pasting between the Seokgatap pagoda on his left, representing Sakyamuni Buddha, and the Dabotap pagoda on his right, representing the Buddha of Many Treasures. Daeungjeon main hall in front of him is dedicated to Sakyamuni Buddha. Daeungjeon (대웅전), the Hall of Great Enlightenment, is the main hall, measuring 53 feet by 47 feet. The hall enshrines the Sakyamuni Buddha and was built in 681 C.E.. To the right of the On either side of the Sakyamuni Buddha statue stand two of his attendants, Miruk Posal (Bodhisattva of the Future) to the right and Chyehwagara Posal to the left. In addition, statues of two of Buddha's disciples, Mahakashyapa and Ananda, are present. Tradition views Mahakashyapa as the wisest of Buddha's disciples selected as the first of 28 Patriarchs of Buddhism. Ananda, a cousin of Buddha, served as the Buddha's secretary. He had the most accurate knowledge of Buddha's words, and is credited with gaining the Buddha's consent for women to enter the priesthood as nuns. Figures of sixteen disciples of Buddha (nahan) are in deep meditation along the right wall of Daeungjeon. The nahan are not the first disciples but, rather, from a later period. The Hall of No Words (Museoljeon). Behind the main hall stands Museoljeon (무설전), the Hall of No Words, the largest and possibly oldest building on the site. This hall gets its name from the belief that Buddha's teachings could not be taught by mere words alone. Probably built in 670 C.E., the Jeon has a platform foundation 112 feet long and has nine pillars. The restoration of Museoljeon took place in 1973; before that time only foundation stone showed. 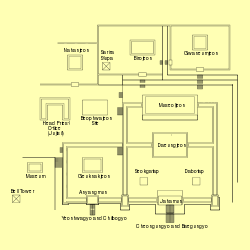 Build during the reign of King Munmu, twentieth king of the Silla Dynasty, Museoljeon originally had thirty two rooms. The Walking Corridor (Haengnang) that encircles the temple compound ends at Museoljeon. Stone steps behind the hall lead to Birojeon and Gwaneumjeon. The Bodhisattva of Perfect Compassion Hall (Gwaneumjeon). The pavilion enshrining Avalokitesvara, the Bodhisattva of Perfect Compassion, is located on the highest terrace just behind Museljeon. The Gwaneumjeon (Avalokitesvara's Shrine, 관음전) houses an image of the Avalokitesvara. The roof rises to a high point in the center. The image of Avalokitesvara is new, while the circular foundation stones that the building pillars set are from the Silla era. During the recent reconstruction, small square tiles are used to imitate traditional temple flooring. Birojeon Buddha Hall. The Birojeon (Buddha Hall, 비로전) sits behind Museolijeon housing the Birochana Buddha image, National Treasure No. 26, designated on December 20, 1962. 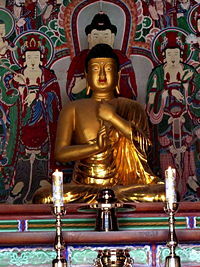 The seated gilt-bronze Vairocana Buddha of Enlightenment is 1.77 meters in height and made from gilt-bronze. According to the Hwaom Sutra, all other Buddhas emanated from Birojeon Buddha, including the historic Buddha of India, Shakyamuni. The image of Vairocana Buddha in Birojean is the oldest known to exist. The head of the Buddha, made by fusing two shells to each other, has an usnisa, a symbol of supreme wisdom. The face is elongated and soft. The elongated ears symbolizes Buddha's obedience to a higher voice and that disciples must hear eternal laws. The robes of the Buddha are highly detailed and the simulation of folded cloth rippling down from the shoulder to the lap is done with high skill. The hands of the Buddha are in a position, the right index finger covered by the left hand, that often is used to symbolize the Buddha of Enlightenment. The hand positions symbolize the unity of spirit and matter, finite and infinite. The figure is determined to be from the ninth century C.E. due to stylistic evidence, including the overly wide lap and the lack of tension in the depiction of the robes and face of the Buddha. Unfortunately the original pedestal is lost. Sarira Pagoda: Treasure #61. This sarira pagoda (사리탑), or stupa, Treasure No.61, is located at the left side of the front garden of Birojeon. Resting on a orante octagonal base, the stone lantern stands 2.1 meters tall. The artifact was at one point taken to Japan in 1906 but was eventually returned. It is from the Goryeo Dynasty and shows the influence of Silla Dynasty art. A sarira is a container for the relics or remains of famous priests or royalty. It is said that this sarira contained the remains of eight priests or a queen. The three main features of the piece are the foundation stone, the main body, and the ornamental top. The foundation is an octagonal stone decorated with carvings. Atop this foundation is a circular stone incised with louts motifs. The pillar supports of the main pody are carved with a cloud motif while the main pody is cylindrical and has four bas-reliefs of Buddha and bodhisattvas and are accompanied by flower motifs. The top of the pagoda has twelve sides which meet into a hexagonal shape. Hall of Supreme Bliss (Geuknakjeon). The Geuknakjeon (Hall of Supreme Bliss, 극락전), is the second, smaller, compound entered by the two section bridge stairs Yeonhwagyo (Lotus Flower Bridge) and Chilbogyo (Seven Treasures Bridge), National Tresure #22. The pilgrim then passes through Anyangmun (Peace Gate) into the Geuknakjeon (Hall of Supreme Bliss) compound. Sitting next to the main compound, which is also entered by bridge stairs, The Hall of Supreme Bliss takes a prominent place in the Bulguksa temple area. The Hall of Supreme Bliss houses the seated gilt-bronze Amitabha Buddha, National Treasure No.27, designated on December 20, 1962. The Amitabha Buddha statute is 1.66 meters in height, cast in the late eighth or early part of the ninth century. Sharing the style of National Treasure No.26, the Buddha of Enlightenment, the craftsman created the head of the statue by fixing two shell-like pieces together. The face of the Amitabha Buddha has a distinctively aquiline nose, broad shoulders and strong chest while the large lap gives the figure a sense of proportional harmony and stability. The style of the robe seems more stylized and haphazard. The position of the left hand raised at shoulder-level palm forward and the right hand is placed at the lap. The style of the Buddha seems to follow an abstract and stylized tradition rather than a representation of realism. Another view of Cheongungyo (Blue Cloud Bridge) and Baegungyo (White Cloud Bridge). A garden at the temple complex. This page was last modified on 21 December 2016, at 16:06.